AFTERNOON: Incoming Ford of Britain MD Mark Ovenden proved to have some enlightening thoughts on not just the UK market but also Russia, the country he was until recently responsible for. The text of that interview will follow. Straight after speaking to Mark Ovenden, I accepted Kia Motors Europe's offer to take an Optima Hybrid out for a test drive. KME's imposing glass and steel high-rise HQ is, handily, mere metres from Hall 5 of the vast grounds of the Frankfurt Messe. 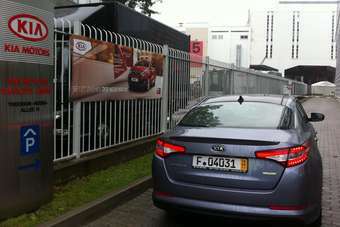 So a quick dash through the rain to KME's carpark, listened carefully to some instructions (I memorised how to scroll through the menu to the Navi's Get Me Home feature, just in case) and thence, up went the barrier and I was out into the midday traffic of central Frankfurt. The Optima Hybrid pulled away in silence. Frankfurt's slippery-wet tram tracks, incidentally, proved no hazard as the Navi system directed me out out of town and onto some faster roads. KME's test cars are US-spec so the ride was cushy and there was certainly more lean out of curving on-ramps to the dual carriageways than you'd expect. But the car itself is whisper quiet and happy at the 120km/h limits I was obliged to stay under.